South Orange County is know for it's luxurious custom homes and upscale gated communities. This webpage will highlight many of these fine neighborhoods and will also list all of Luxury homes for sale in south Orange County. What is a Luxury Home Anyway? Area 1: Over $3 Million for the cities of Newport Beach, Corona Del Mar and Newport Coast. Area 2: Over $2 Million for the cities of Laguna Beach, Dana Point and San Clemente. Area 3: Over $1.5 Million for the cities of Irvine, Laguna Niguel, Laguna Hills, San Juan Capistrano and Coto De Caza. Area 4: Over $1 Million for the cities of Aliso Viejo, Mission Viejo, Ladera Ranch, Lake Forest and Rancho Santa Margarita. A typical Luxury home in Area 1 would cost around $3.5 Million and would comprise of a roughly 4,000 square foot of living area situated on a large lot of around 10,000 square feet and may include a golf course view or a partial ocean view. The age of the home could range from the mid 1970's to modern day construction. 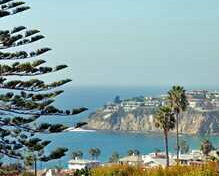 The average luxury home in Area 2 would be priced around $2.75 Million and is situated in the hillsides of Laguna Beach with sweeping ocean views on a modest sized lot of about 6,500 square feet. The home would be anywhere from 2,000 to 3,000 square feet in size and could range in age from the mid 1960's (albeit with many fine upgrades) to modern day construction. A luxury home in Area 3 in Laguna Niguel is priced around $2.25 Million and is located in a gate guarded community with a nominal 3,000 square foot home with many modern interior upgrades and finishes situated on a lot of around 6,000 square feet. In Laguna Hills this home would probably be located in Nellie Gail on a 20,000 square foot estate zoned for horses. In Area 4, the typical luxury home priced in the range of $1.5 Million may be located in Mission Viejo and would comprise of a 4,000 square foot home built in the mid 70's or mid 80's on a large 10,000 square foot lot, with many modern upgrades and possibly a hillside or city light view. If you would like a private tour of any of the Luxury homes that you have found in this website, please feel free to contact us.